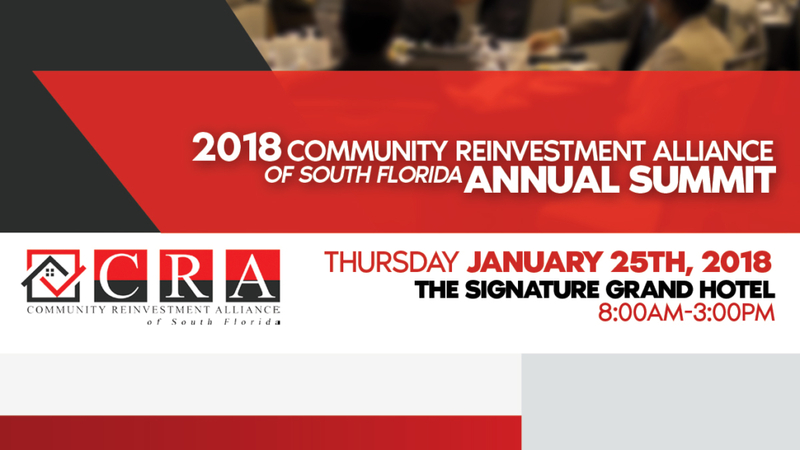 (Davie, FL – January 25, 2018) – The Community Reinvestment Alliance of South Florida (CRASF) will host its 3rd Annual South Florida Community Reinvestment Summit on January 25, 2018 at the Signature Grand located at 6900 FL-­‐84, Davie, FL. More than 200 community leaders, as well as community-­‐based organizations, financial institutions, public officials, and national speakers will convene to discuss innovative initiatives and solutions several economic, social, and environmental issues. This year’s theme is “Economic prosperity for the people, by the people”. Joining this year’s Summit are Jesse Van Tol, COO at The National Community Reinvestment Coalition (NCRC); Phillip W. Bracken, Chairman of the Board & Founder of America’s Home Alliance; Stella Adams, Chief Equity and Inclusion for the National Community Reinvestment Coalition; Evelyn S. Dobson, CEO of Delray Beach Community Land Trust; Cornell Crews, Executive Director of CRASF; Maria Coto, Executive Director at Partners For Self Employment Inc.; Adrian Madriz, Project Lead at Struggle for Miami’s Affordable and Sustainable Housing (SMASH); Don Patterson, REVA Development Corporation; Courtney Biscardi, Sr. VP of Operations and Strategy at Urban League of Broward County and Bob Dickerson, Executive Director of Birmingham Business Resource Center and CEO of Foundation Capital. Registration for the Summit is $25 per person or $100 for an annual membership to CRASF and the Summit. Renaissance Plantation Hotel on the night of January 24, 2018; the hotel is a 5-minute drive to the Signature Grand. support, and implement sustainable solutions to enhance and empower neighborhood and individual wellbeing. To learn more about CRASF, visit www.crasf.org, call (786) 361-2673 or email info@crasf.org. BROWARD COLLEGE AWARDS $5K TO HOUSING AUTHORITY OF THE CITY OF FORT LAUDERDALE... It’s National Mentoring Month!